From right to left - Mr Eng Sheng Guan, CEO MOLPay Sdn Bhd, Mr Gary Brown, CEO 7-Eleven Malaysia Holdings Berhad, Mr Hans-Peter Ressel, CEO of Lazada Malaysia. 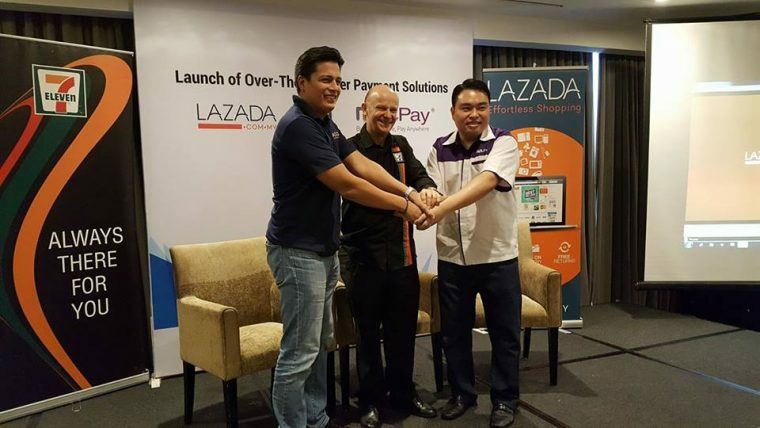 We caught up with Gary Brown, CEO of 7-Eleven Holdings Berhad, during the official launch of the collaboration between Lazada and 7-Eleven on offline payment service on 11 May 2017. We asked him about own label and future plans of 7-Eleven, the biggest convenience store chain in Malaysia. Brown described the convenience store chain’s private label strategy as “selective but aggressive.” He cited “own label in general in Malaysia is relatively small.” In hypermarket, “private label is a small percentage of hypermarket sales,” said Brown. 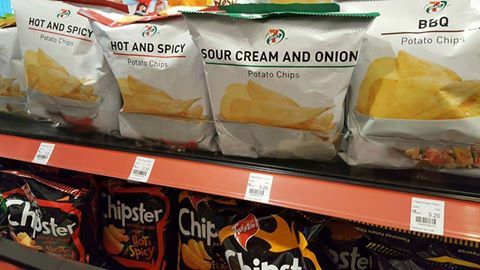 Even though own label’s revenue contribution is small, he said 7-Eleven is seeing “fantastic traction on own label.” Brown used the words “extremely well” to describe the performance of 7-Eleven’s private label bread and potato chips. He added the retailer has gone into paper products such as tissues where they have become the number two brand in store. Brown said they are “caution in the way we roll it [own label] out so that we don’t get too aggressive” as own label is small in the country. 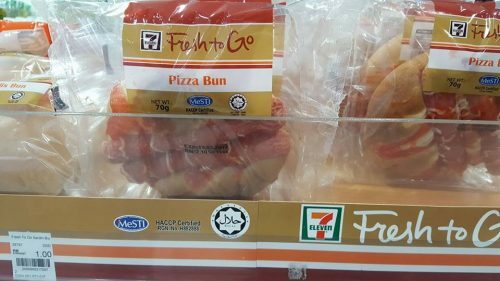 When it comes to private label packaged bread, 7-Eleven wants customers to feel that its own label packaged bread is totally fresh. The strategy was to move the packaged bread from the enclosed shelf out to the open. We have talked about this in our earlier post. When asked if there are plans to change the packaging of the own label bread, Brown said the convenience store chain has “plans in place to make it more eye catching and more attractive but still with the cues of fresh.” He cited examples of colours such as purple or bright green that could make consumers feel that the packaged bread is not fresh. The key reason why the packaging of the bread is currently brown is because brown conveys a sense of “freshness,” explained Brown. Brown said the company saw good growth in confectionery, salty snacks and perishable produce like dairy. Strong growth is also seen in hot beverage like coffee (RM 2 per cup) and fresh food such as sandwiches. The retailer has added more healthier products to its range to meet consumer demand for healthier options. There are Wi-Fi in some outlets. However, Brown does not “foresee they will go to every store because he thinks it is not necessary” citing “connectivity is so much available.” Strong connectivity has made having Wi-Fi inside the store becoming “not a real necessity in every single store” but the retailer “will look at a selected basis” for stores that need Wi-Fi. Adding seats inside convenience store is a natural progress as “consumers become more convenience savvy” stressed Brown. He wants his customers to become comfortable. If the customer feels comfortable, they will buy more products from the store. The two factors that affect the opening of new stores are location and market condition, said Brown. 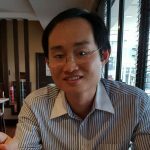 He described the current market as being “very soft.” 7-Eleven will open at least 150 stores per year with 35% of the new stores to be located in the Klang Valley and the rest in the north in Penang, in the south in Johor Baru (JB), East Malaysia (Sabah and Sarawak) and East Coast. The capital expenditure to open 200 new stores and refurbish 200 outlets in RM 85 million per year. The illicit cigarette trade accounted for 57.1% of market share as of December 2016, according to a report by The Edge Malaysia. The jump in the share of illicit cigarette market share is attributed the 40% hike in excise duty in November 2015. Tobacco accounts for over one-third of revenue in 2010-2013, making it an important revenue contributor to the store, according to the 7-Eleven Malaysia IPO prospectus. Brown said “consumer confidence has been very soft and has been for sometime.” He said the soft spending can be seen in “all retail markets.” He felt 2018 would be better than 2017. The timing of election will also affect consumer confidence. In the Philippines, the election year in 2017 boosted the revenue of the local 7-Eleven operator. 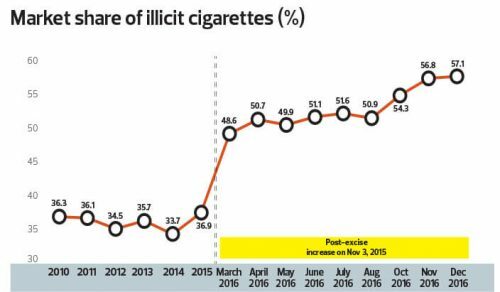 “The improved financial performance was boosted by election related spending in the first quarter and continued up to the second quarter,” said Philippine Seven Corp.
*Image of market share of illicit cigarette from The Edge Market, April 2017. The other images were photographed by the author.